Crepidotus calolepis, is an oysterling very similar to Crepidotus mollis, the Peeling Oysterling. 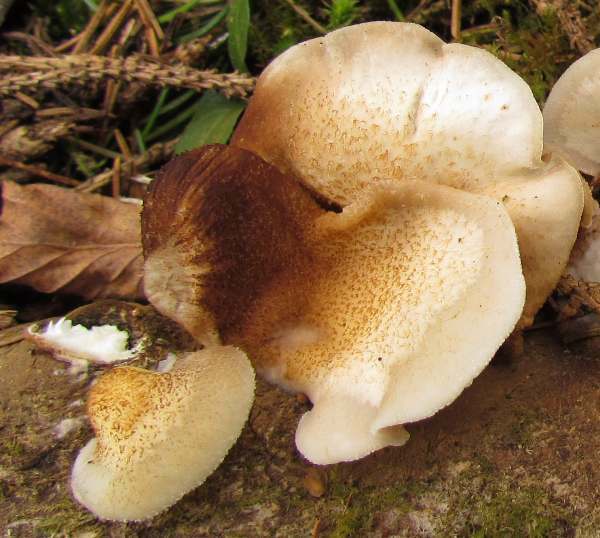 It is usually a fan-shaped but occasionally (as shown in the main picture on this page) rosette-shaped rubbery fungus that grows on the trunks and stumps of dead broad-leaf trees. It is inedible. This oysterling occurs on mainland Europe, but to date there is no conclusive evidence that British records are other than scaly forms of C. mollis. In 1873 the great Swedish mycologist Elias Magnus Fries described this mushroom and gave it the binomial scientific name Agaricus calolepis. (In the early days of fungal taxonomy most gilled species were initially placed in a huge Agaricus genus, since largely redistributed to other newer genera.) It was the Finnish mycologist Petter Adolf Karsten (1834 - 1917) who transferred this species to the genus Crepidotus, establishing its currently accepted scientific name as Crepidotus calolepis. Synonyms of Crepidotus calolepis include Agaricus calolepis Fr., and Crepidotus mollis var. calolepis (Fr.) Pilát. The generic name Crepidotus comes from crepid- meaning a base such as a shoe or a slipper (although some sources state that it means 'cracked'), and otus, meaning an ear - hence it suggests a 'slipper-like ear'. In the past mushrooms in this genus were sometimes referred to as slipper mushrooms. The specific epithet calolepis may come from the roots calo- meaning beautiful and lepis, meaning with scales. This woodland fungus certainly does produce some very beautiful scaly-capped mushrooms. 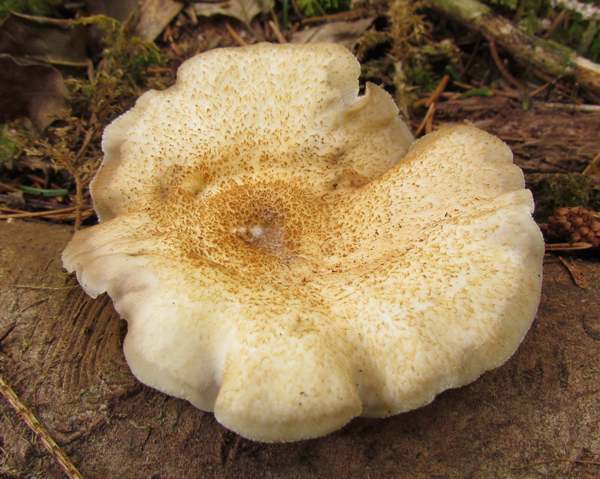 Initially pale but covered with minute dark-brown scales, the kidney-shaped caps turn ochre-brown with age. Faint striations are sometimes visible towards the margin of the cap, which has a gelatinous layer in the upper part of the flesh; this layer is very elastic, and when it is stretched a see-through window can be created. The cap flesh is white, very watery and easily broken. The pale brown gills fan out from the attachment point; they are soft and gelatinous. As the fruitbody ages, the spores mature and the gills turn rusty brown from the centre. 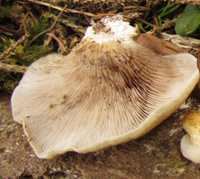 Usually there is no visible stipe (stem), the attachment to the substrate being at one edge of the cap from which the gills radiate. Exceptionally the attachment may be at a central point, with a stemless rosette-like fruitbody resulting. Saprobic, on stumps, dead trunks and fallen branches of deciduous trees, mainly poplars; sometimes emerging from cracks in living poplar trees. Crepidotus mollis lacks (or has very few) dark brown scales on its cap surface. Crepidotus calolepis is considered by some authorities to be merely a scaly form or variety of Crepidotus mollis. This rare summer and autumn species is of dubious edibility and may even be poisonous. Care is needed, therefore, when collecting edible Oyster Mushrooms, Pleurotus ostreatus, to avoid accidentally gathering Crepidotus calolepis instead. The brownish spore print of oysterling mushrooms readily distinguish them from edible Oyster Mushrooms, whose spore prints are white. Pat O'Reilly; Fascinated by Fungi, 2011.